This website is the first to be dedicated entirely to the Battle of Belvedere, and the fighting that took place in the vicinity of Monte Cassino, Italy, from 25 January 1944 to 4 February 1944, during the Italian campaign of the Second World War. It saw the Tunisian 4th Rifle Regiment (4th R.T.T. ), which was part of the French army, pitted against the German forces that were deployed behind the notorious Gustav Line. This website, whose aim is purely historical, is intended: (i) to describe the week long battle that was waged by the men of the 4th R.T.T. in extremely harsh climatic conditions; (ii) to present the testimonies of the soldiers of the 4th R.T.T. ; and (iii) to collect all relevant documents relating to the Battle of Belvedere (photographs, reports, letters, and all other relevant items). According to General de Gaulle, the Battle of Belvedere was one of the most glorious French feats of arms of the Second World War. Now, however, it is almost totally unknown to the general public and it has mostly been forgotten by the modern French army, which hardly commemorates it. These days of extreme violence on Italian soil will gradually be forgotten if the descendants of the French, Tunisian, Algerian and Moroccan soldiers who fought there do not take action to inform our contemporaries of just what happened during this fight for their freedom. However, while the memory of the Italian campaign is slowly fading, there has recently been a revival of interest in both the campaign and the French victories. Jean-Christophe Notin, a historian, produced an extremely detailed work on the subject in 2002 (“La Campagne d’Italie – les Victoires Oubliées de la France”). A work dedicated to the 4th R.T.T., “Sidi Brahim des Neiges” by Paul Nicolas, has just been published. Meanwhile, specialist historical journals are now devoting more space to this subject than in the past. Another cause of this renewed interest has been the media attention given to the participation of soldiers from the former French colonies in the fighting from 1943 to 1945. As a result, a new generation of French people have learnt of the long Italian campaign and the French victories that were part of it. Indeed, these had mostly been eclipsed in the collective memory by operation Overlord (the Normandy landings that began on 6 June 1944) in which the French participation was insignificant (177 Frenchmen took part in the Normandy landings, compared with the 115,000 soldiers of the French Expeditionary Corps in Italy). 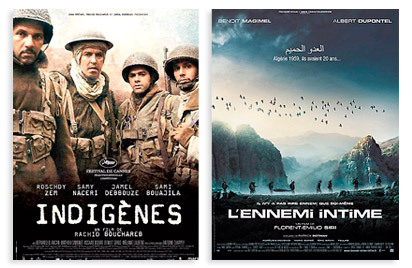 Finally, at the cinema, the film “Indigènes” [“Days of Glory“] directed by Rachid Bouchareb (2006), has certainly helped to revive the memories of these French victories. “L’Ennemi Intime” [“Intimate Enemies“] (2007), a film by Florent Emilio Siri, looks at more hidden aspects of the battles of Monte Cassino and the fighting at Belvedere. Having explained the purpose of this website, we call upon anyone who is interested, particularly the descendants of the French, Tunisian, Algerian and Moroccan soldiers who took part in the Italian campaign in 1944, to look in their private archives or otherwise revive the memories that they received from their parents or grandparents who took part in the campaign. The survivors of Belvedere are now few in number and their testimonies are of vital importance. We would particularly like to thank Colonel Marius Lagrange whose testimony was essential in the creation of this site. Anyone who would like to contribute a testimony of any kind, provide a document or who simply wishes to record their response to the site may leave a message on the site forum.